Disclaimer: These numbers are most certainly “WRONG!” You should NOT use this post or anything from a random only tool to plan or execute dives. You WILL get bent. Not “may”, but WILL. You know this. DO NOT rely on this tool. Suppose you make it to your first deco stop and want to adjust your deco based on what happened between your max depth, and hitting the deco stop. Say you had a reg failure and had to fix it. Or a scooter got entangled in the line. Or you had a reverse squeeze so you had to pause for a bit longer. Now you’re AT your deco stop, and you’ve got two things – your average depth by the time you hit the stop, and your total runtime for the dive. 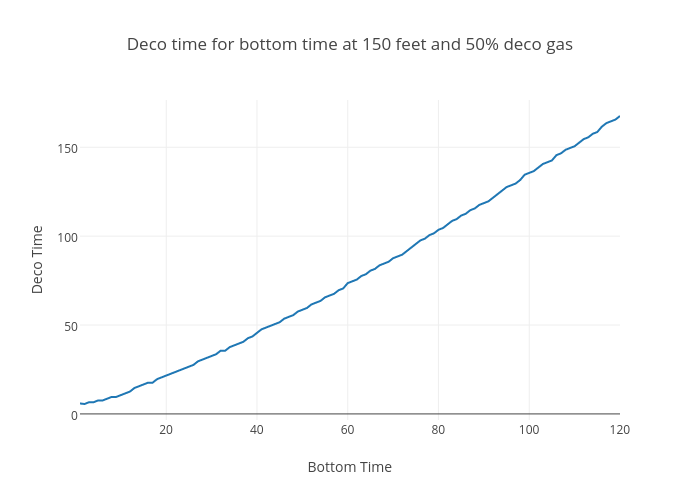 Given those two numbers, if you had to calculate deco, how much would it vary based on calculating it as a true multi-level dive where you accounted for the pause as a scheduled “level stop”? Side note: Once again, remember the purpose of these questions isn’t about what should happen or should never happen, but to create a strong feedback loop in ensuring what should NEVER happen as a function of the cost/risk you incur when you do so. Basically if it should turn out that stopping mid way, and not keeping track of where you stopped and how long you stopped is going to add a ridiculous increase in deco, then you HAVE to make sure you remember it. If it should turn out, it doesn’t add more than a few minutes of deco based on your avg depth observed at your gas switch, then you can in an emergency, get the hell up to that gas switch, switch over, and run the numbers based on what you saw then. var cumulativeDepth = (25 * 200) + (5 * 100); //Avg depth so far (25 mins at 200, and 5 minutes at 100 - which is mid-point when descending). 1. If all you did was compute deco based on your avg depth + time after having hit the stop, the biggest difference I could find was a little over 6 minutes (and it was negative.) Meaning, if we did the entire dive at Avg depth, we’d be calling 6 minutes more at most. 2. The maximum deviation expressed in percentage points, was 13 percent. Meaning adding a safe 15% to what would be deco based on avg depth would be a good rule of thumb. I haven’t played with greater depths or attempted to plot/chart these to get a visual “feel” for how the curves shape up. I haven’t tried VPM. For a technical, philosophical and every other view on No-Deco limits, go to scubaboard. First let me elaborate on why the mathematical model is important and how to play with it. This post is about understanding the mathematical model in terms of the NDLs we know and use. One of the most important things about any model is, once you have verified it in one direction (how much deco must I do for a specific dive), you can then run it in the other direction (how much can I dive, before I have mandatory deco.) You can then understand what parameters, adjustments, corrections, variations other people were using when they came up with the numbers they gave you. This is a subtle point and one excites me the most. 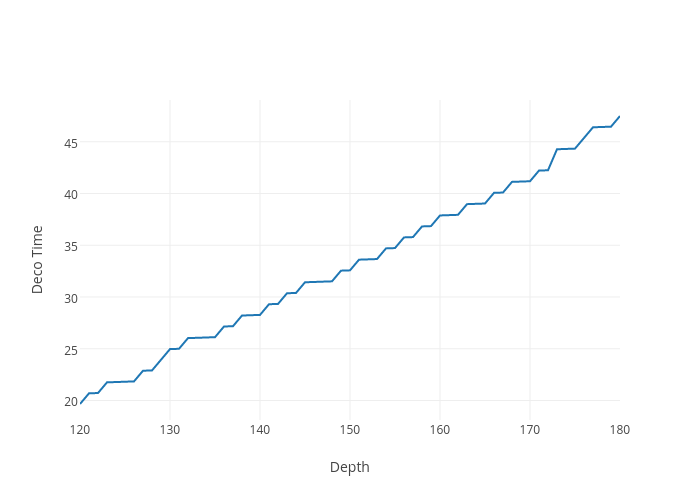 What this means is, if someone said to me, “Let’s dive to 100 feet, for 40 minutes, on 32%, and ascend while stopping two minutes every ten feet.”, I now have the tools guess their parameters. Suppose they were using VPM, then I can reverse-engineer things like what bubble sizes they considered “critial”, and what their perfusion rates were assumed to be, etc. If they were using the Buhlmann, I can reverse-engineer their gradient factors. This is awesome because it allows me to break down the black box a little – instead of whining about “My computer said 10 minutes, and yours said 20 minutes”, I can whine in a far more specific and deeply annoying way – “Oh I see, my computer is assuming critical He bubble size to be 0.8 microns, but yours is assuming 0.5 microns.” Remember kids – you shouldn’t always whine, but when you do, make it count! While these ARE “just models”, models are nothing if they are not properly parameterized. Here again, existing software came short in what I could do with it. The GUI is a great tool for a narrow specific task. But when exploring the model, nothing is more useful and powerful than being able to play with it programmatically. Once I begin posting recipes you’ll know what is so fascinating about “playing with it”. If you’re a fan of the Mythbusters, you will see them refer to this as, producing the result. Let us say we had a few things in our control – ppO2, ppN2, ppH2, bottom time, ascent rate, descent rate, stops. What a mathematical model allows us to learn (and should help us learn), is how sensitive the plans are to each of these parameters, even if specific constants are wrong. Let me put it this way – if you wanted to guess the sensitivity of a “car” to things like – weight, number of gear shifts, size of wheels, etc., and you had a hummer to study with, and but had to somehow extend that knowledge to an sedan, how would you do it? The “constants” are different in both. But the models aren’t. An internal combustion engine has an ideal RPM rate where it provides the maximum torque for minimum fuel consumption. The specific rev rate will be different. And you can’t account for that. However, the “speed at which inefficiency changes”, is a commonality in all internal combustion engines. Unless the sedan is using a wenkel engine, the rate-of-change characteristics still apply. Even if the hummer’s ideal RPM 2000, and the sedan’s is 1500, the questions we can still study are – when I deviate 10% from the ideal, how does that affect fuel consumption, and torque? So even if the software/constants I wrote are entirely wrong (which they probably are), they still serve a valuable tool in studying these changes. The point here was to recreate an approximation of the dive tables. What fascinated me was how much subtle understanding there is behind that number though. First let’s define an NDL as: Maximum time at a depth, with an ascent ceiling of zero. 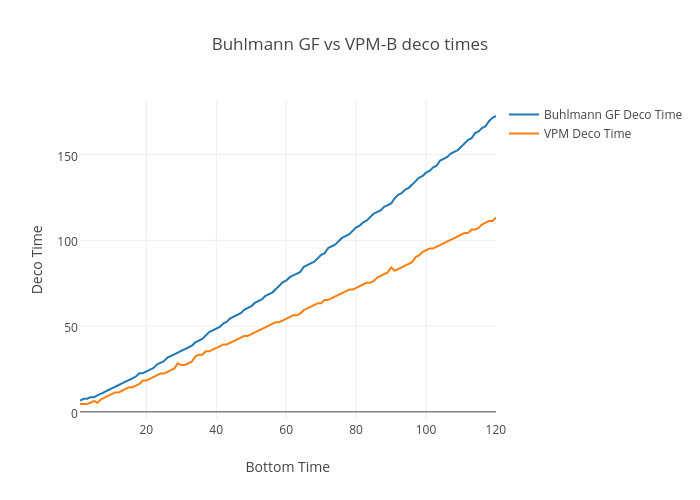 So what happens when we run pure Buhlmann without a gradient factor? Does it mean my model is wrong? My software is wrong? Compare it with different depths, and you’ll find it gives consistently shorter NDLs. What gives? Let’s try fudging the conservativism factor a bit. That’s just about where we expect it to be. This tells me that the NDL could have been computed with a less conservative factor. But is there something I’m missing? Wait a minute, this assumes you literally teleport to the surface. That’s not usually the case. Let’s run the same NDL with a 30-feet-per-minute ascent (this time we have to use the getCeiling method). That’s interesting. For the same parameters, if we assume an ascent of two minutes, our NDL went up – we can stay down longer if we are ASSURED of a 30-feet-per-minute ascent at the end. Now remember these numbers are entirely made up. My constants are probably helter-skelter. You shouldn’t use the SPECIFIC numbers on this model. But there’s something intuitive we discovered. Once again these numbers make sense – if we are ASSURED of a 3 minute stop at 15 feet, our NDL goes up. How interesting. This gives you a better idea of a “dynamic” dive. You aren’t exactly teleporting from depth to depth, and those ascents and descents matter. Try this for different gasses.